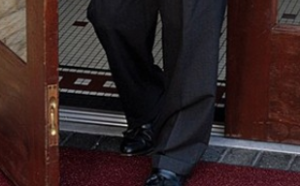 Durable Corporation’s new 2014 catalog features a number of new outdoor entrance mats designed to prevent dirt and moisture from entering your building. If you have yet to receive your updated catalog, or simply want a sneak preview, this post includes brief descriptions, specifications, and pictures for each new entrance mat. Ideal for use in medium to high traffic outdoor areas, the Par-K entrance mat features a Parquet pattern for excellent multi-directional cleaning performance. The molded rib scraper design removes heavy dirt and debris with ease. 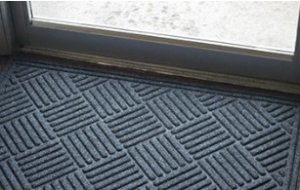 Durable Corporation’s new Cross Ridge Entrance Mat features a needlepunch carpet design with a decorative, non-directional scraping pattern and a double border to trap dirt and moisture. 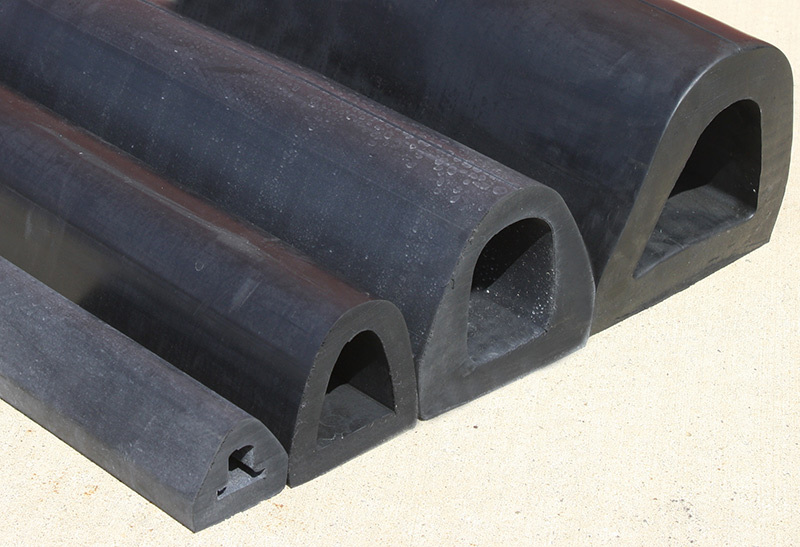 Frontrunner is a heavy duty, extruded PVC entrance mat designed for excellent drainage and superior traction. The Frontrunner features an aggressive open grid tread surface that traps dirt while allowing moisture to drain with ease. 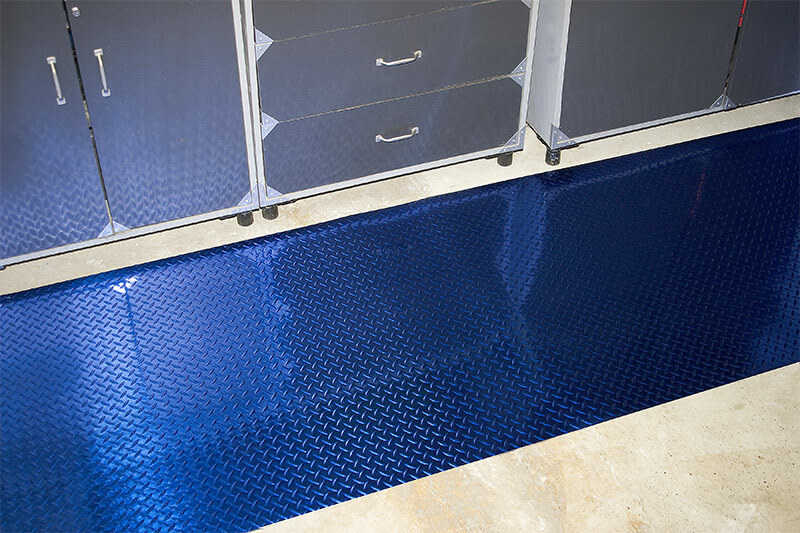 A heel and wheel proof entrance mat solution, Frontrunner is available in rolls for larger coverage areas. Brush-N-Scrape is an aggressive nylon brush scraper mat featuring premium cleated rubber backing, ramped edges, and drainable borders. Material: Solution dyed nylon carpet with rubber backing. 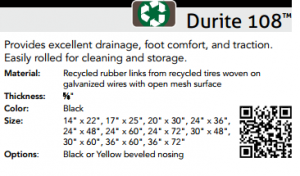 Rubber backing has 20% post-consumer recycled car tire content. 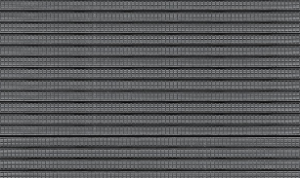 6′ x 16′, 6′ x 20′; Special cuts 3′, 4′, and 6′ wide up to 60′. Sold in one foot increments only. 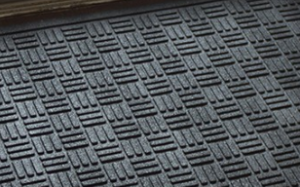 Durable Corporation’s new Cushion Tile ENT features charcoal polypropylene carpet set in a durable PVC tile. Ideal for entrances where drainage and cleaning shoes is a must, Cushion Tile EBT installs in a linear or parquet fashion for an attractive appearance. 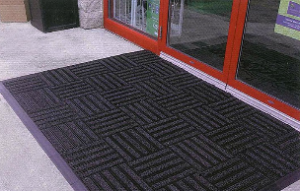 To learn more about new entrances mats available from Durable Corporation, or to request sample swatches or a price sheet, contact our customer service department for further assistance. 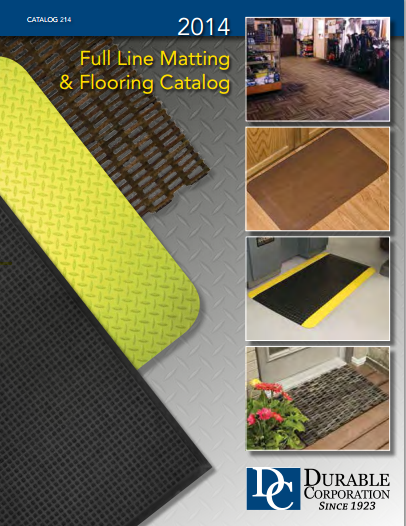 Durable Corporation is proud to announce the release of our 2014 Full Line Matting and Flooring Catalog. Current dealers and distributors can expect to receive updated catalogs in the next few weeks, but for immediate access, a pdf version is available here. With 28 pages showcasing our time-tested performers and 20 new products, including Safe Zone High Visibility Matting, Designer Dura-Tile II, Diamond Dek Sponge Supreme, and Easy Stand PATENTED Anti-Fatigue flooring, the 2014 Full Line Matting and Flooring catalog is bigger and better than ever. 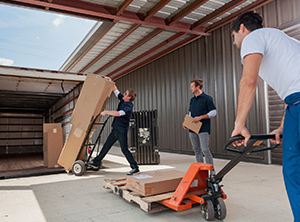 This new feature allows our 2014 catalog to work hand in hand with your Smartphone, Notepad, or Computer. Please note that price books are only available in pdf format or online. To request your new catalog or register to download the price book, please email or contact a member of our customer service team at 800-537-1603.